Here's everything from inside Kapil Sharma-Ginni Chatrath's wedding reception. Comedian and actor Kapil Sharma hosted his third wedding reception last night in Delhi. In attendance were Sohail Khan, Mika Singh, Daler Mehndi, Yuvraj Singh, Suresh Raina, Vatsal Sheth and Harshdeep Kaur among others. It was a starry night and Kapil had so much fun there. The internet is filled with the pictures and the videos of the actor enjoying the night like a king. He can be seen singing to songs and also shaking a leg with the guests. In one photo, he and his wife Ginni Chatrath are seen posing with prominent names of the industry. In another video, Kapil is crooning to a song with singers Harshdeep Kaur and Daler Mehendi. 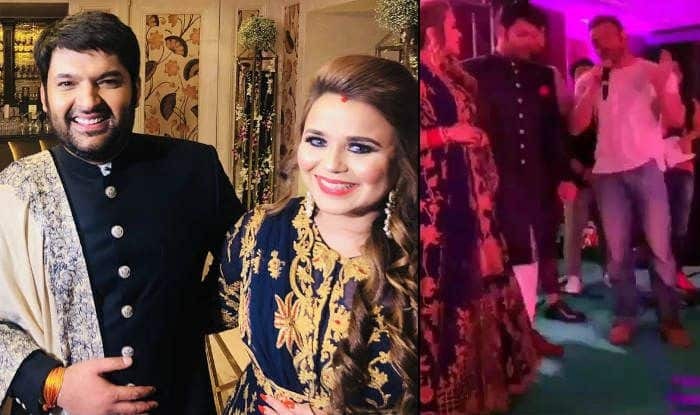 Kapil and Ginni got married as per Sikh and Hindu wedding rituals on December 12, 2018, in Punjab. The couple then threw a lavish wedding reception in Mumbai, which was attended by Ranveer Singh-Deepika Padukone, Anil Kapoor, Rekha, Kriti Sanon, Salim Khan, Raveena Tandon among others. Kapil is also back with a bang on the small screen. His The Kapil Sharma Show is performing well in terms of the TRPs. The actor is joined by comedians Bharti Singh, Krushna Abhishek, Kiku Sharda, Chandan Prabhakar, Sumona Chakravarty and Rochelle Rao on the show.